Pushing the envelope in terms of aesthetics, performance, sustainability, resilience and life cycle benefit. Sponsored by Acpexpress, Dow Corning, FiberTite, Metl-Span, Parex, Pella EFCO Commercial Solutions, Serge Ferrari, Tubelite Inc.
Identify and recognize the significance of building enclosure and façade components in both the design and performance of buildings. Assess the performance aspects of exterior wall and fenestration systems as they relate to code compliance, energy performance, durability and sustainability. Explain the importance of proper design and construction techniques to help assure that systems perform as intended. 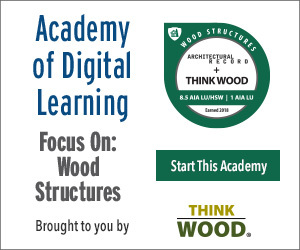 Determine ways to incorporate the principles presented into specific building projects as shown in case studies. Building design continues to evolve as they are pushed by owner desires, code requirements, and computerized design capabilities. This is most evident in the building enclosure systems which include building facades, fenestration, and roofing systems. All of these have grown more and more complex and are typically less forgiving in order to meet demands for energy performance, occupant satisfaction, cost requirements, and durability over time. Therefore, it is incumbent upon architects to stay up to date with emerging technologies, products, and systems that are available for optimizing performance while satisfying client and design needs. Over the past decade, the growing significance of building enclosures has been evidenced by the increased attention being paid to this topic by design professionals. Some of this is the result of a joint effort between the National Institute of Building Sciences (NIBS) Building Enclosure Technology and Environment Council (BETEC) and the American Institute of Architects (AIA) who signed an agreement in 2004 to establish the Building Enclosure Council (BEC) initiative. Currently, more than 3,000 affiliated architects, engineers, contractors, manufacturers, and others with an interest in building enclosures participate in Building Enclosure Councils (BECs) around the country in 26 chapters representing both cities and counties. These BECs promote the exchange of information and encourage discussion on matters concerning the products, systems, and science used to enclose buildings. Further, they address related topics such as training, education, technology transfer, weather conditions, and local issues. As a resource to this effort, NIBS, under guidance from the Federal Envelope Advisory Committee, has developed a comprehensive guide for exterior envelope design and construction for institutional and office buildings. Known as The Envelope Design Guide (EDG) it is continually being improved and updated through the BECs. 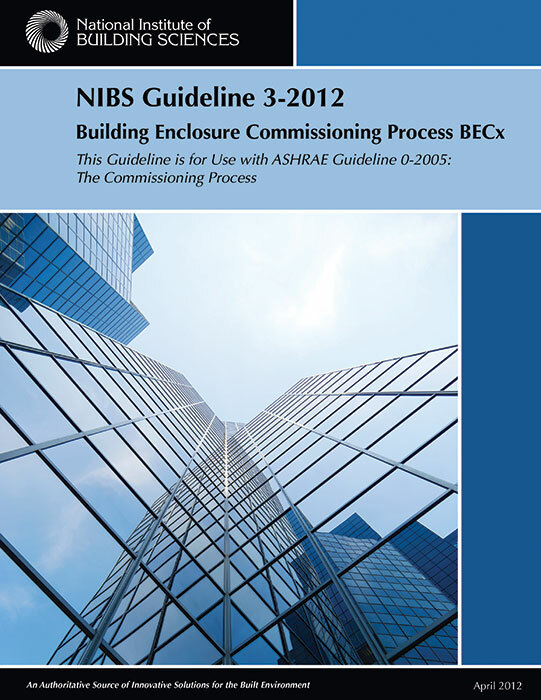 A recent development in the work of the BETEC is the creation of a NIBS Guideline for the Building Enclosure Commissioning Process (BECx). This effort recognizes that, just like other critical elements of a building, an independent review or commissioning process is an impartial way to see that the design and construction of facades, fenestration, roofing, etc. are all carried out and tested appropriately to perform as intended. As stated in the document, this “Guideline provides recommendations for navigating the enclosure commissioning process from its necessary inclusion in project planning to its continued emphasis throughout the life of a building. The Guideline is intended to be usable by all owners for all building types.” Regarding the process, it goes on to point out, “The Building Enclosure Commissioning (BECx) process is utilized to validate that the design and performance of materials, components, assemblies and systems achieve the objectives and requirements of the owner. The BECx process achieves this through experience, expertise, modeling, observation, testing, documenting and verifying materials, components, assemblies and systems to validate that both their use and installation meet the owner’s requirements.” Those interested in assuring proper building envelope performance will be well served by using this document and process. As building facades and enclosures become more sophisticated and complex, they are called on to meet higher demands for both design and performance. The National Institute of Building Sciences (NIBS) Guideline for the Building Enclosure Commissioning Process (BECx) is a free resource for anyone interested in better performing building enclosures. In light of this trend for better performance while still meeting other client and user demands, we will look at eight items that can help architects create building enclosures that perform better, look better, and remain within budget and schedule. Acpexpress™ is a revolutionary new aluminum composite wall panel system manufacture. Acpexpress™ features WORLD PREMIER STRUCTURAL 3-DIMENSIONAL Panel Systems. Acpexpress™ is also launching to the industry a new patented rigid PVC attachment system which features 95% thermal break performance. The Dow Corning® Silicone Air Barrier System – which features Dow Corning® DefendAir 200 and new Dow Corning® 778 Silicone Liquid Flashing – helps extend building envelope protection and simplifies installation. The ABAA-evaluated system exceeds industry standards for airtight performance, and its all-silicone formulation minimizes sequencing and compatibility issues. FiberTite® Brite™, featuring custom colors and patterns, is a unique roofing membrane that allows architects to design a high-profile roof which will complement the overall building design. FiberTite® Brite™ is the combination of three proven technologies: FiberTite® roofing, Seaman Corporation’s Architectural Fabric technology, and Kynar fluoropolymer top-finish. The HPCI Barrier™ metal wall panel is an air, water, thermal and vapor barrier panel that can be used behind any type of façade. The HPCI Barrier™ back-up panel is installed in a horizontal orientation completely outside the structural supports. It’s time to envision the possibilities of AquaSol™ — a power-packed acrylic finish and coating with enhanced hydrophobic and photocatalytic technology. In addition to the impressive features found in standard acrylic finishes, AquaSol™ also repels water, reflects UV rays, and reduces pollution. The performance ratings (CW30 to CW50), sizes (up to 6’ wide x 12’ high), Class 5 balances, and triple-pane insulated glass options you need are available in historically correct wood windows. Transform the exterior appearance of any building—and improve the energy performance and comfort for occupants—with Serge Ferrari’s lightweight, flexible, and dimensionally stable composite materials for façades. Your design ideas are virtually limitless, with complex curvatures, digital printing, image projection, and LED lighting. 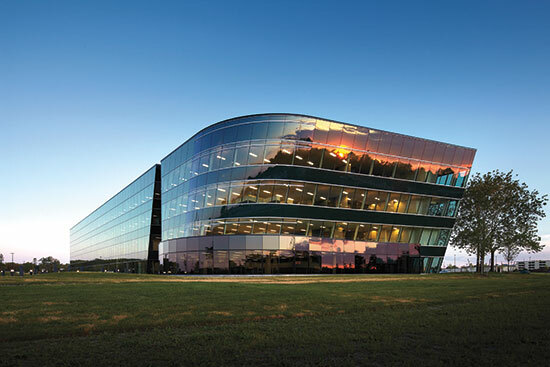 Thermally broken curtain wall designed to meet or exceed today’s stringent energy codes. The 400TU Series has a 2½” face, and offers screw-spline or shear clip assembly. The dual thermal strut decreases U-Factors and increases CRF significantly over many current thermal barrier systems.